Washington and Lee University School of Law is home to the papers of Supreme Court Justice and W&L alumnus Lewis F. Powell ’29, ’31L. 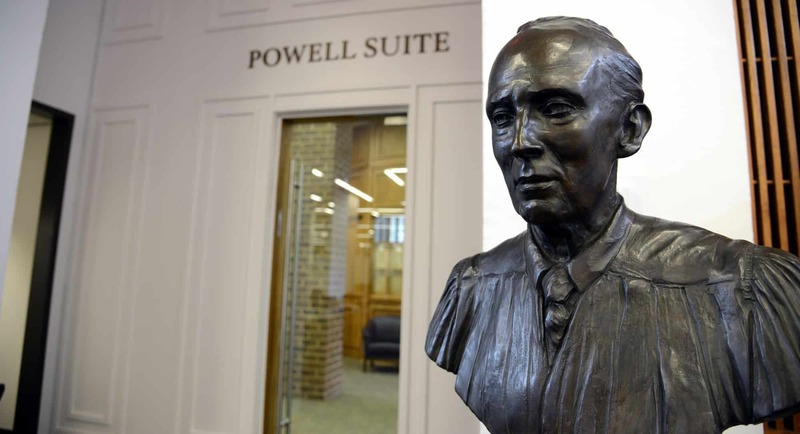 Twenty-five years ago, on April 2-4, 1992, ceremonies, dinners and an academic symposium marked the dedication of the Lewis F. Powell Jr. Archives, and of the addition to the law building known as the Powell Wing. In the intervening quarter century, the law school has hosted countless researchers visiting the archives. The Powell Papers have formed the basis of many books and articles, and contributed to hundreds more. Several documentary films have also used these materials. John Jacob has served as archivist since its establishment. In 35 years of practice at the Richmond firm of Hunton & Williams, Powell became both its chief rainmaker and leader in pro bono work. One of seven W&L Law graduates to lead the American Bar Association, Powell’s legacy as ABA president is most evident in the creation of the Legal Services Program and the Constitutional amendment on presidential succession. Appointed by President Nixon, Powell served as an associate justice of the U.S. Supreme Court from 1972-1987. Most closely associated with the Bakke decision, Justice Powell’s ability as a consensus builder made him a powerful swing vote on the Court. In December 1989, Justice Powell announced his intention to leave his personal and professional papers to the Washington and Lee University School of Law. Construction on a new wing of the law school began in 1990 and included areas to house his papers and facilitate their use by researchers. The new facilities were dedicated on April 4, 1992. Justice Powell and dozens of his family members, personal friends and professional associates were in attendance. Distinguished speakers included Chief Justice William Rehnquist, Judges J. Harvie Wilkinson and Robert Merhige, Powell clerk and biographer John C. Jeffries, former Virginia Governor Linwood Holton and civil rights legend Oliver Hill. Academics presenting at the symposium included Scot Powe, Jean Love, Sanford Levinson and Catharine Wells. 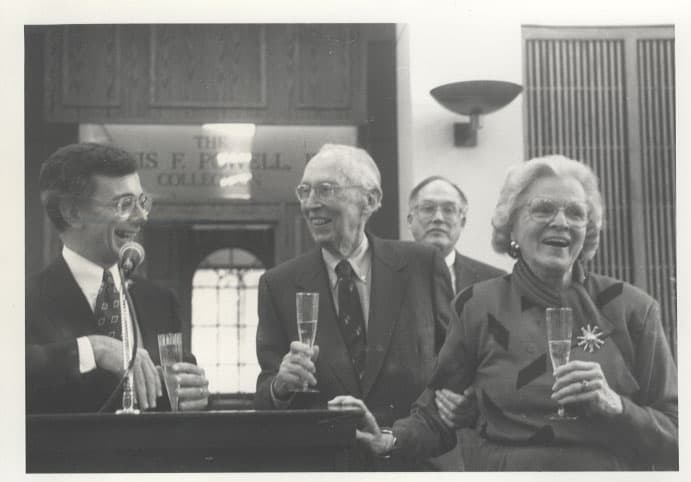 Dean Randall Bezanson, Justice Lewis F. Powell Jr., Chief Justice William H. Rehnquist, Josephine R. Powell at Dedication of the Lewis F. Powell Jr Archives. Read more about the archives here.